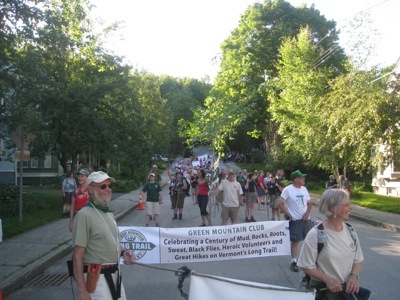 In celebration of the Green Mountain Club's 100th birthday, the Montpelier Section is again marching in the city's Independence Day parade. The popular annual event takes place on Saturday, July 3. Participants gather in the staging area at 5 P.M., for a 6 P.M. start. At the front of the Montpelier Section contingent will be club and section banners. The 27-foot Long Trail banner, prepared for the section's fiftieth anniversary, will be carried through the streets by hikers, sporting as many GMC logos as possible. They will be joined by trail workers, bikers, paddlers, snowshoers, and skiers, bringing the Green Mountains into the heart of Montpelier. You are invited to join the Montpelier Section on this briefest, easiest club outing of the year. Children and youth are especially welcome. To enlist, contact parade coordinators Thomas Weiss or Reidun Nuquist. GMC board member [and Montpelier Section officer and activist] Dave Blumenthal died June 24, a month after receiving a President's Award from the club for his outstanding volunteer work (see p. 8). Dave, 37, was critically injured after he collided with a pick-up truck while descending a remote mountain road in Colorado on his mountain bike. He was competing in the Tour Divide, a 2,780-mile mountain bike race from Banff to New Mexico. Dave was flown to Denver, where he died the next day. Dave Blumenthal was a graphic designer and artist, and operated Studio Zoic in Montpelier, custom-designing furniture and exhibits. He graduated from Harvard and had a Master's degree from the Pratt Institute. Dave was very generous with his time and talents and volunteered for several other area organizations in addition to the Green Mountain Club. He enjoyed many outdoor adventures, including hiking in Alaska and backpacking the Pacific Crest Trail with his wife Lexi Shear. He also restored their Victorian house in Montpelier, doing much of the work himself. Dave leaves his wife Lexi, their four-year-old daughter Linnaea, his brother Pete Blumenthal, and his parents Ralph and Jenni Blumenthal of Holmdel, New Jersey. A memorial service for Dave Blumenthal was held outside GMC's Visitor Center Saturday, July 10. Over 225 family and friends attended. Dave Blumenthal was one of the most active and creative volunteers in the Green Mountain Club's living memory. The club is a tight-knit community, and Dave leaves a giant empty place at our table. But GMC cannot make special claim to Dave's legacy. He was so many things to so many people. All of us gathered here today are now included in a new, larger community, pulling in friends and energy from many directions, with Dave at its heart. Speaking to all fellow members of this new community I propose that we make a pledge to each other: Let's all try to be a little bit stronger and a little bit braver. Let's try to be a bit more thoughtful with our words a bit more clever and creative with our hands. Let's be quicker with our smiles. Let's all be a bit more generous and a bit more gentle. In short let's try to be a bit more like Dave. If we can do that, we will all carry him with us through all of the adventures and discoveries which lie ahead, and his work of community-building will live on. "Many members have helped get out the newsletter over the years: Esther Farnsworth, Marilyn Wilson, Andrew Nuquist, Barbara Agnew, Mary Deaett, and Doris Washburn." 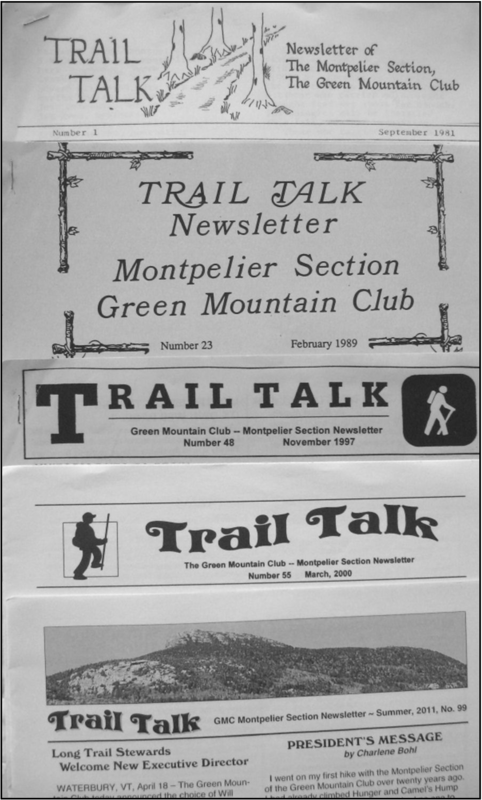 The editors for the first hundred issues of Trail Talk have been, in total, Reidun and Andrew Nuquist, Barbara Agnew, and (since 1999) Nancy Jordan. Printing for the last several years has been by L Brown & Sons Printing in Barre. Saturday, September 1, 2012, was a remarkable day in the history of Bamforth Ridge Shelter, the Montpelier Section, and the Green Mountain Club. On that date some sixty relatives and friends of Douglas Crowell gathered to honor him and to endow Bamforth Ridge Shelter in his memory. Doug died a year ago, at age 37, after a courageous seven-month battle with leukemia. He left behind his wife Melissa (Missy) Watts Crowell -- they met when they were in their teens -- and their young sons, Brogan and Ethan. A native of Connecticut, Doug came north to attend the University of Vermont. He grew to love the Green Mountains and the Long Trail, making life-long friends who shared his love of the outdoors. 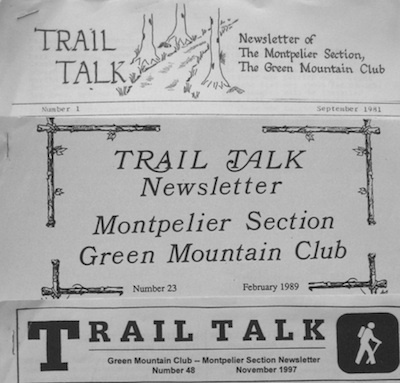 Upon graduation in 1997, Doug hiked the Long Trail in a mere eighteen days. After serving in the U.S. National Guard in Kuwait and Iraq and earning a graduate degree in landscape architecture from the Rhode Island School of Design, the Green Mountains called him back: ten years after leaving Vermont the first time, he and Missy settled in Hinesburg where they lived with a grand view of Camel's Hump. Upon Doug's death, family and friends chose to memorialize the popular outdoorsman in several ways. Fletcher Allen Hospital placed a bench in his memory on the green roof that he, as landscape architect, had designed for the Radiation/Oncology Center. The Vermont chapter of the American Society of Landscape Architects launched a lecture series in his name. Xavier High School in Middletown, Connecticut, which Doug attended, received the Doug Crowell Memorial Scholarship Fund. According to Missy, Doug had a special enthusiasm for hiking and for pushing himself hard; the outdoors "always provided a certain peace and solace" for him. To honor his passion she decided to endow a Long Trail shelter, picking Bamforth Ridge Shelter -- built by the Montpelier Section in 2002 -- because of its location on Camel's Hump. Many people contributed to the new Long Trail Shelter Maintenance Endowment that will enable the GMC to forever maintain a refuge for Long Trail hikers on the mountain's northern flank. September 1 turned out to be a perfect late-summer day for celebrating Doug. After a brief ceremony at the trailhead, attended by section members Robert Lorenz, Andrew Nuquist, Reidun Nuquist, and Eric Seidel, about forty people, some very young, hiked up the not-so-easy Long Trail from the Winooski River to Bamforth Ridge Shelter. There Doug's friend, Jim Arrigoni, read aloud some of Doug's logbook entries from his Long Trail end-to-end hike. Doug was an amazing father, husband, son, brother and friend. He had many talents and passions in life and a gift for attracting people with his Humor energy and wit. Doug loved the outdoors and in 1997 "old Crow" solo hiked the Long Trail end to end in 18 days. At 37 he was taken too soon by acute myeloid leukemia. GMC Director of Development Maisie Howard worked closely with the Crowell family to establish the shelter fund, helped organize the memorial event, and represented the club on the memorial hike.